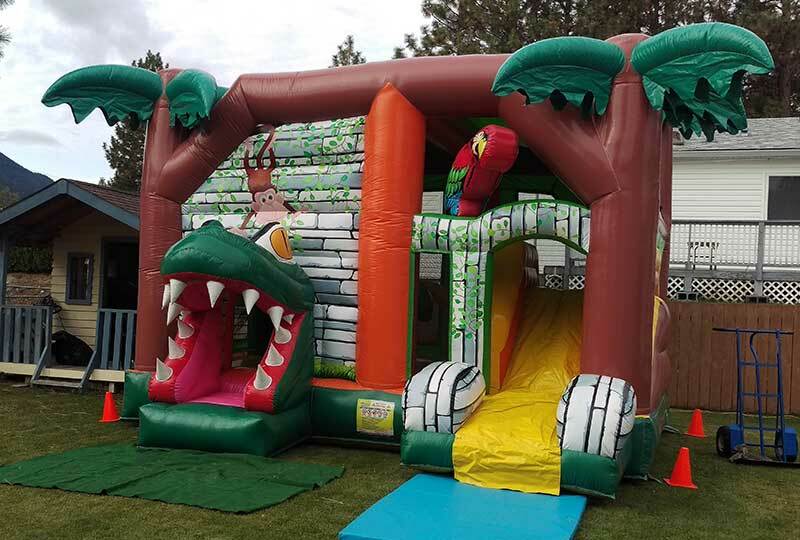 This is our most budget friendly unit – but not short on fun! 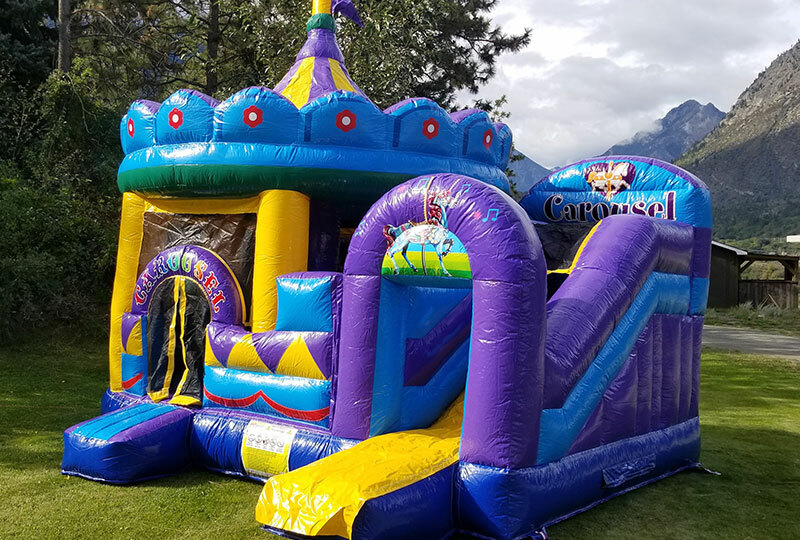 This Deluxe, Bright, Fun Bouncy Castle features some interactive features inside the bouncing area, as well as a fun slide to exit the fun! 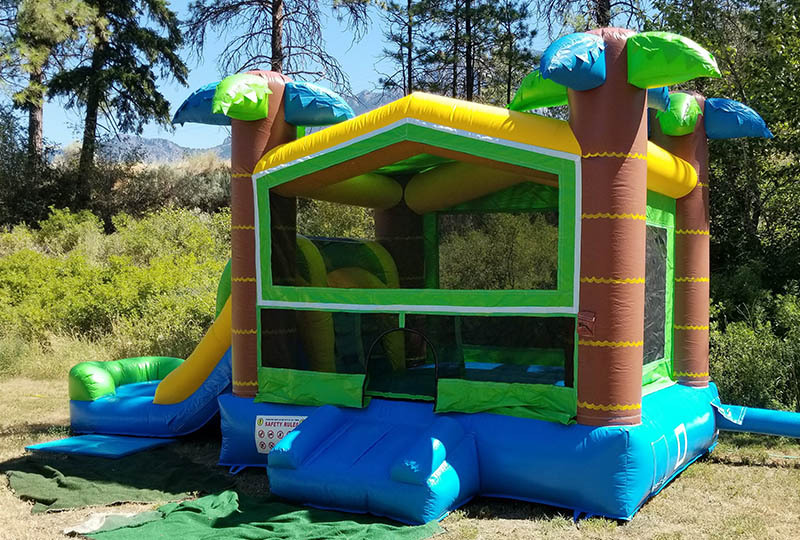 This unit has a shade roof. 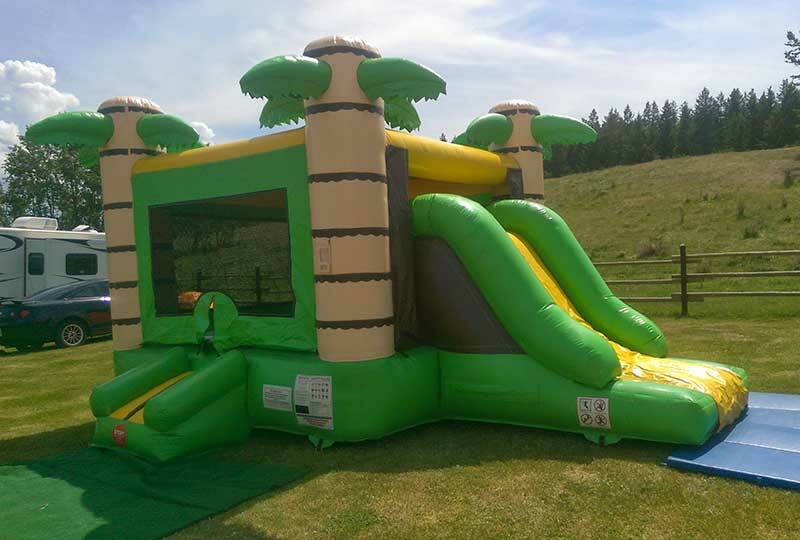 Our Tropical Jungle Bounce & Slide is very similar to our very popular Paradise Bounce & Slide unit, just a bit smaller! 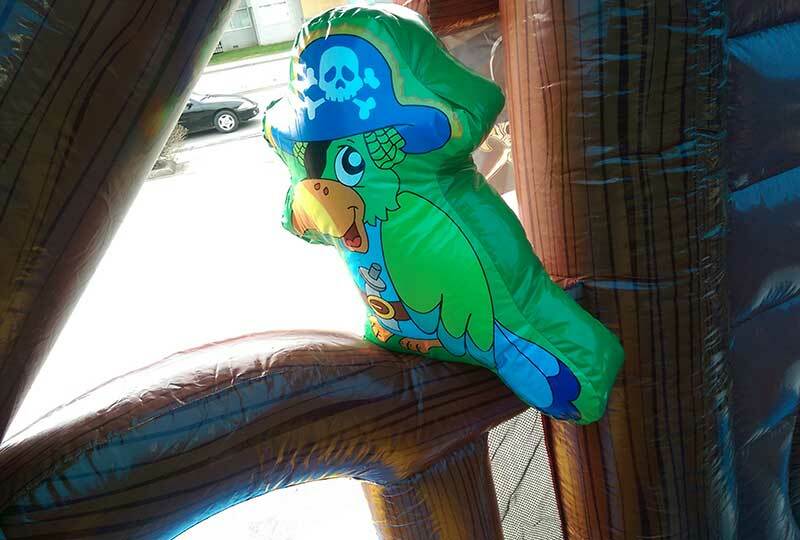 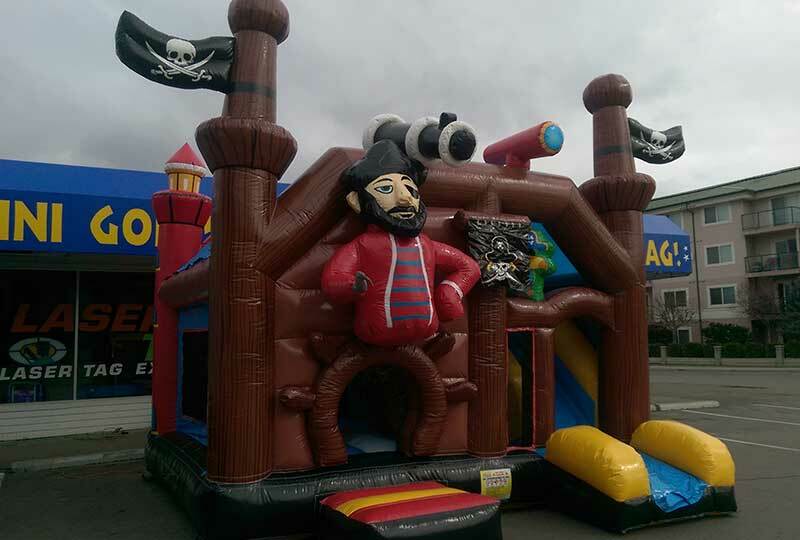 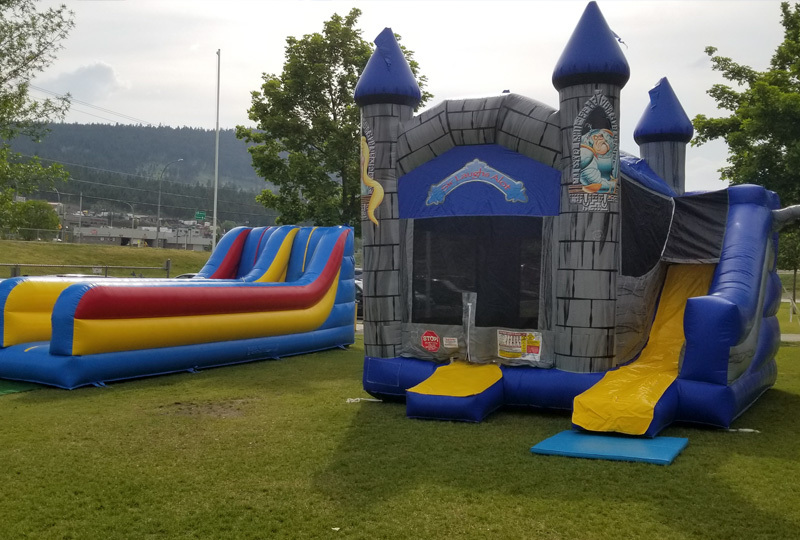 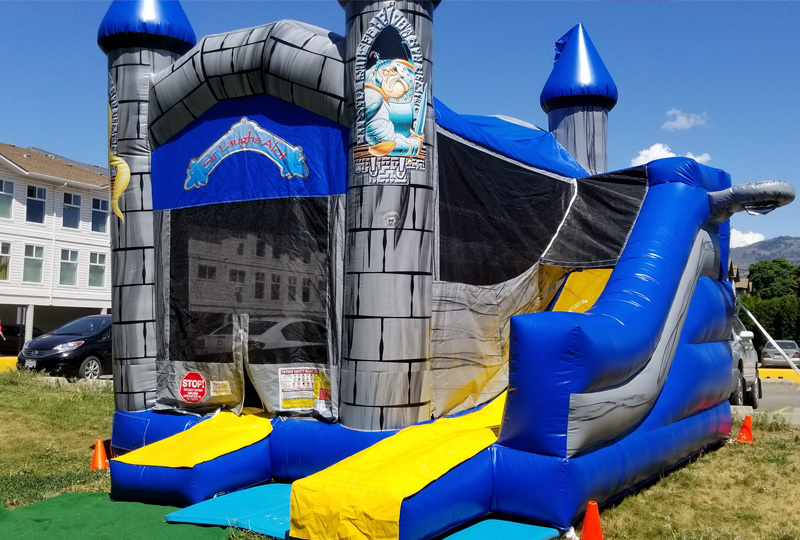 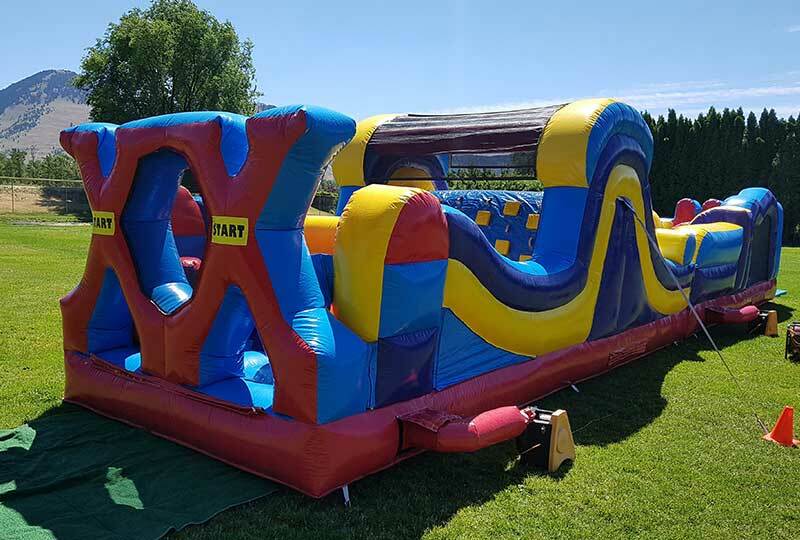 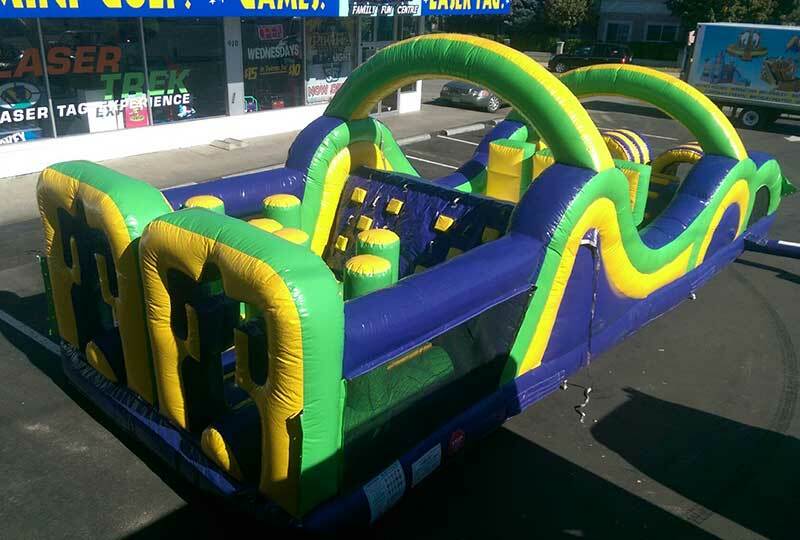 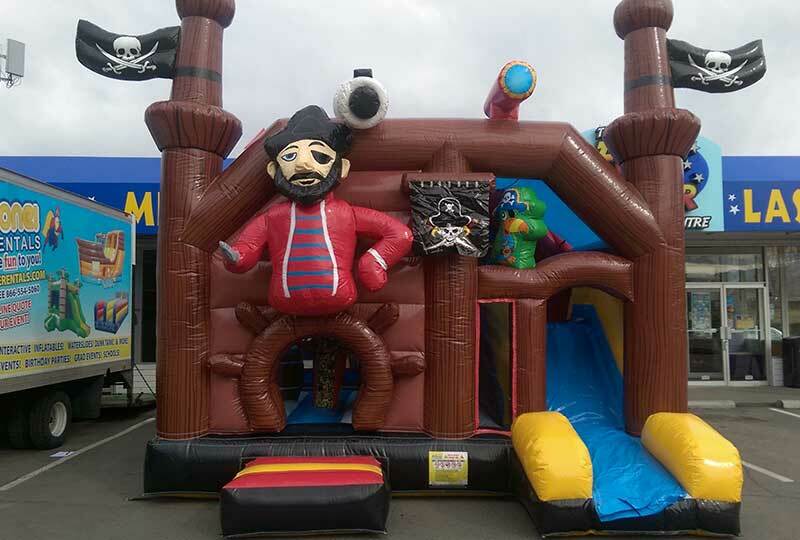 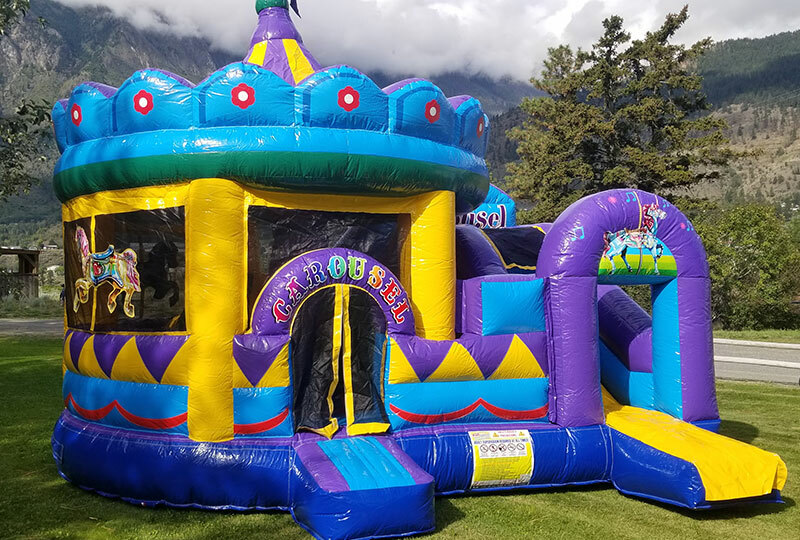 This inflatable is perfect for the younger kids as it's easy for them to maneuver around while still giving them the fun thrill of a big bouncer! 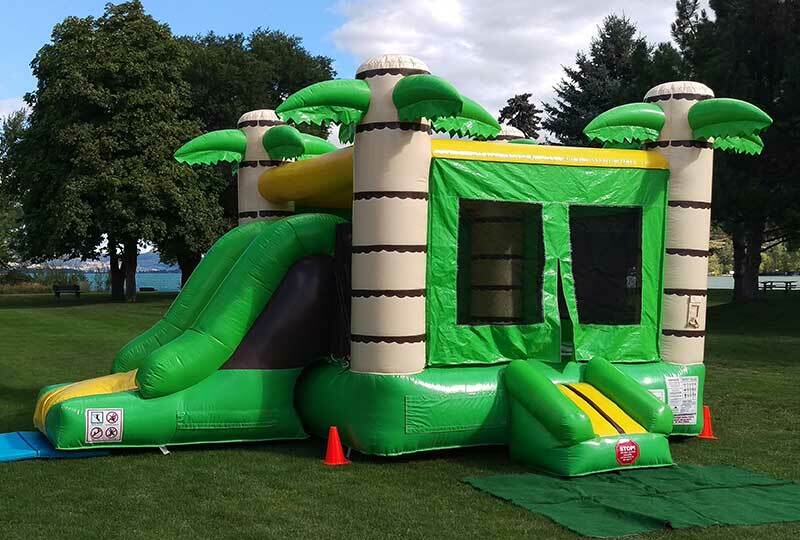 ​Our Jungle Bounce & Slide unit features Bright, Tropical Themed Fun including a bouncing area, basketball net, small climbing wall, and slide. 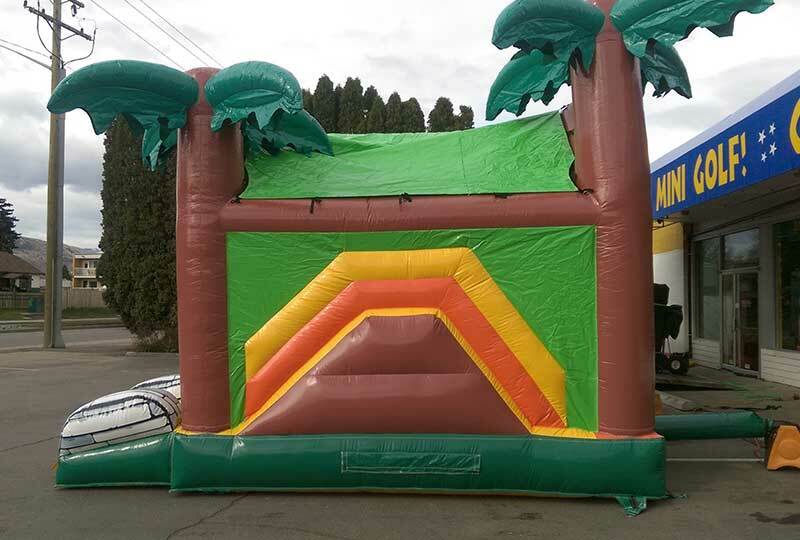 Great for your Tropical Themed Event! 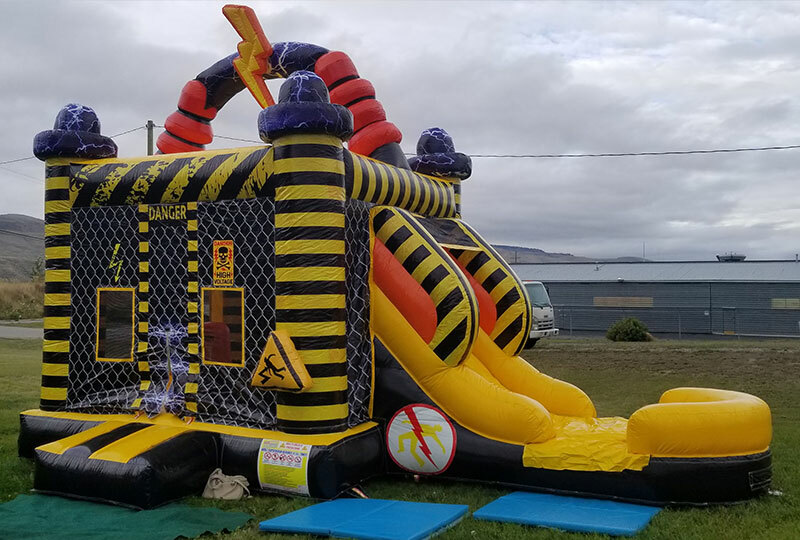 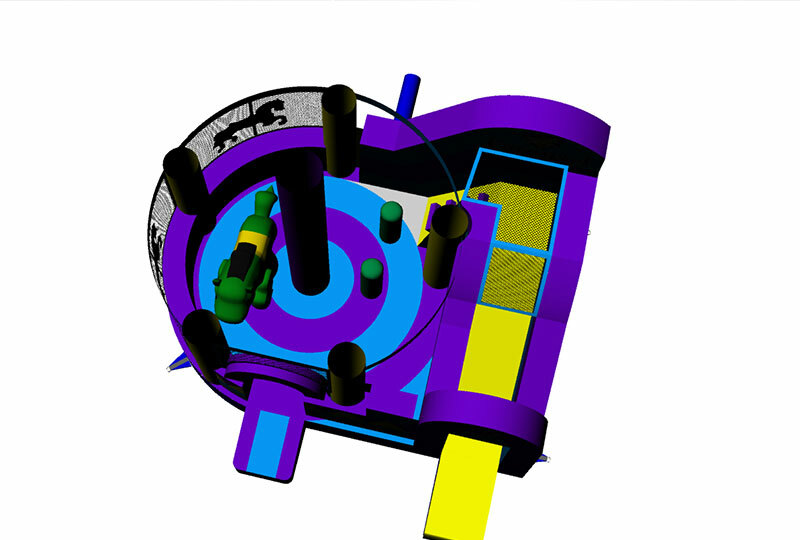 Your guests will experience High Voltage excitement in our Power Station Bounce & Slide! 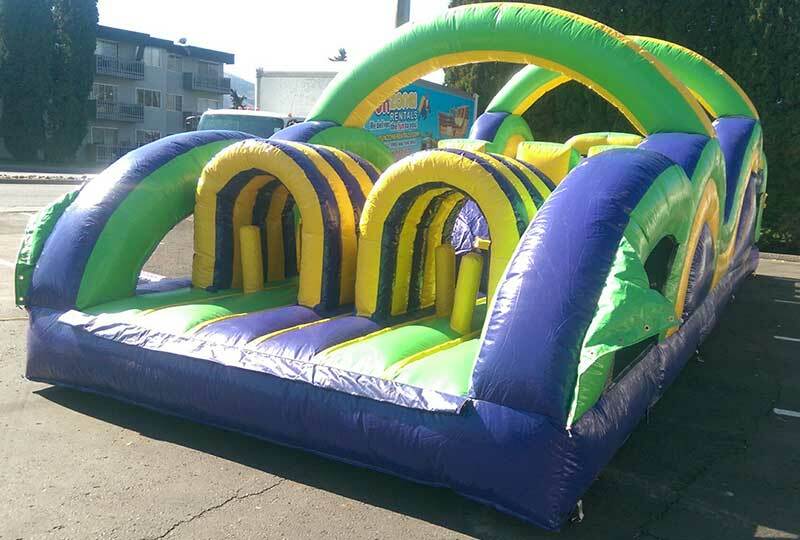 Multiple interactive features inside this unit will add to the fun! 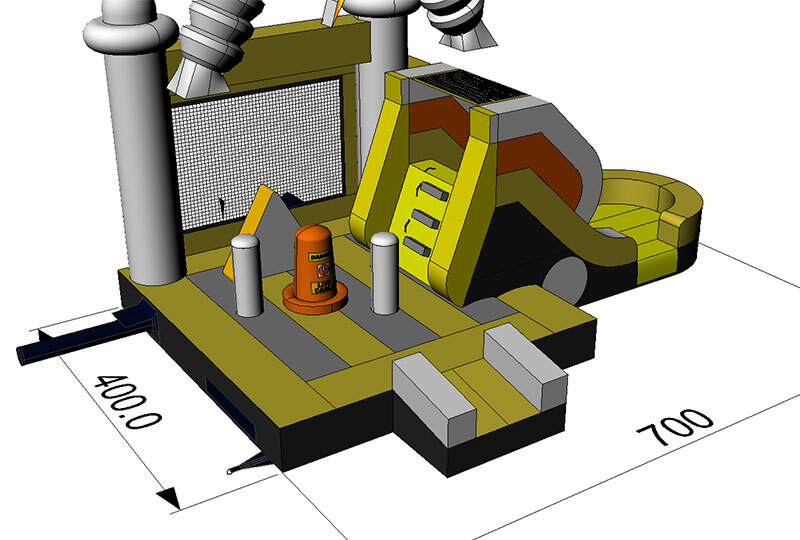 Exit the Power Station down the slide! 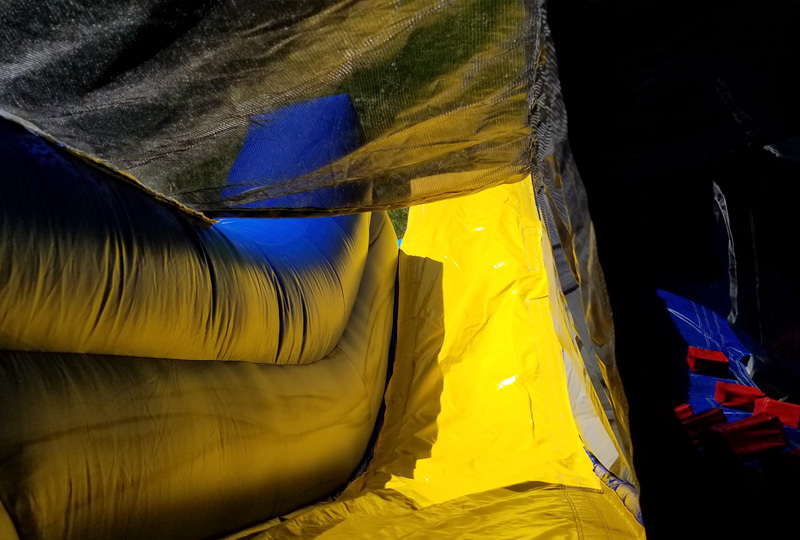 This unit has a shade roof. 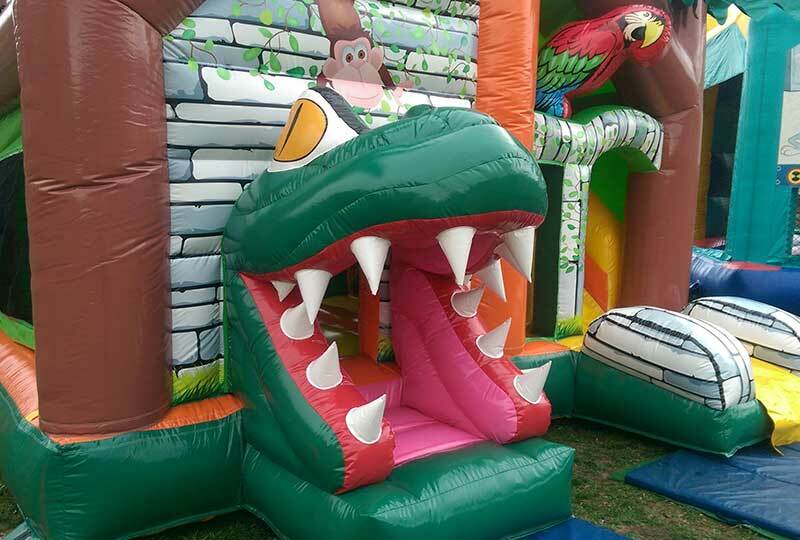 Enter the reptiles mouth for a tropical adventure! 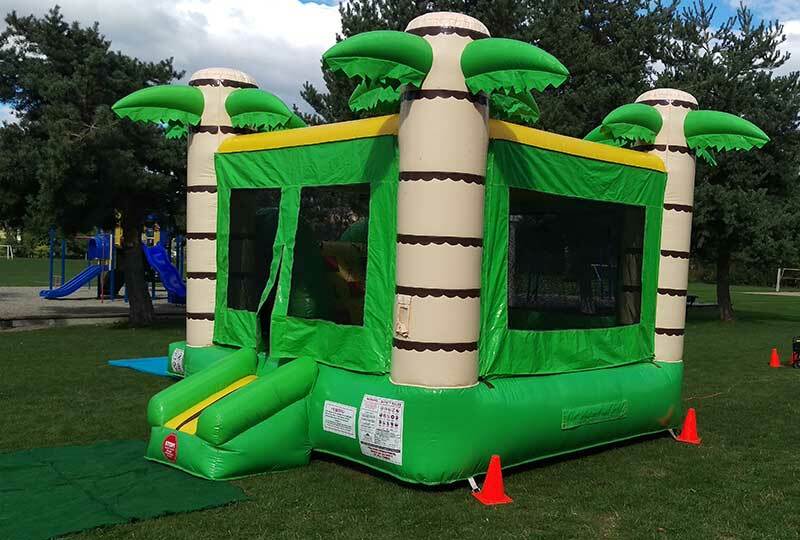 A fun combo unit that features a pop-up tree inside the bounce area that kids can interact with! 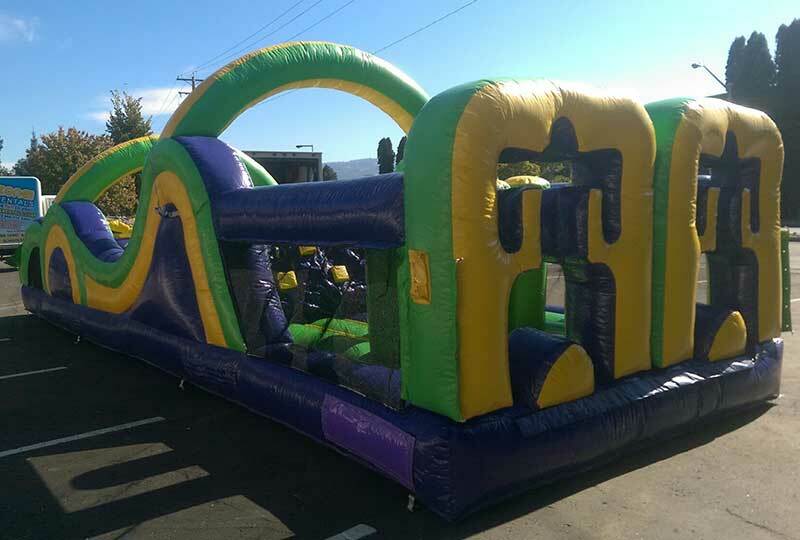 This bright, eye catch combo unit also features a fun slide for the kids to use that exits to the outside! 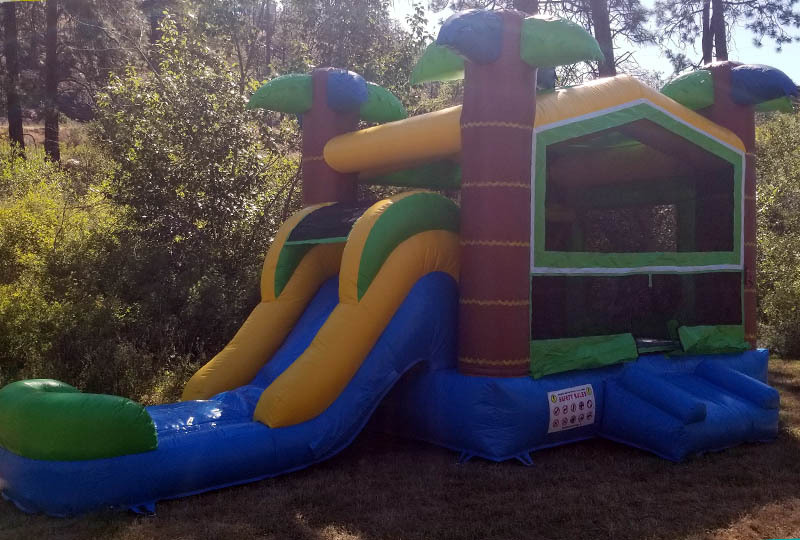 This is a great unit for boys and girls! 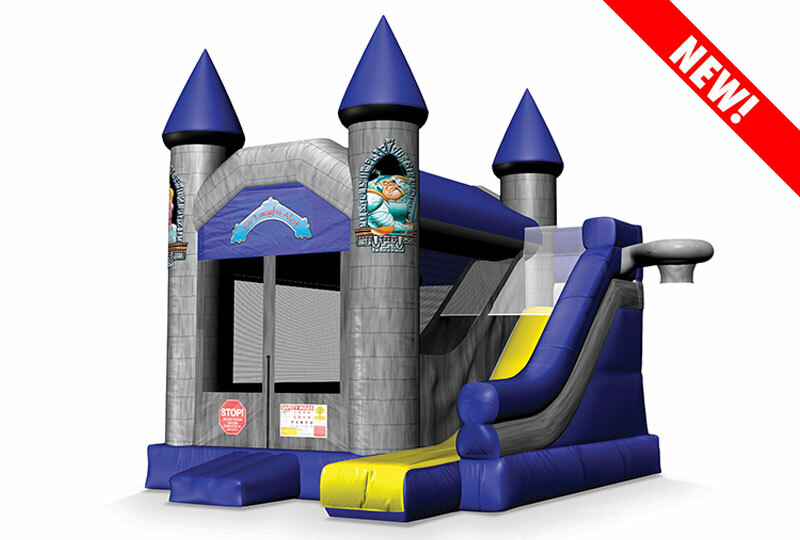 Have some medieval themed fun on our NEW Wizards Castle Combo! 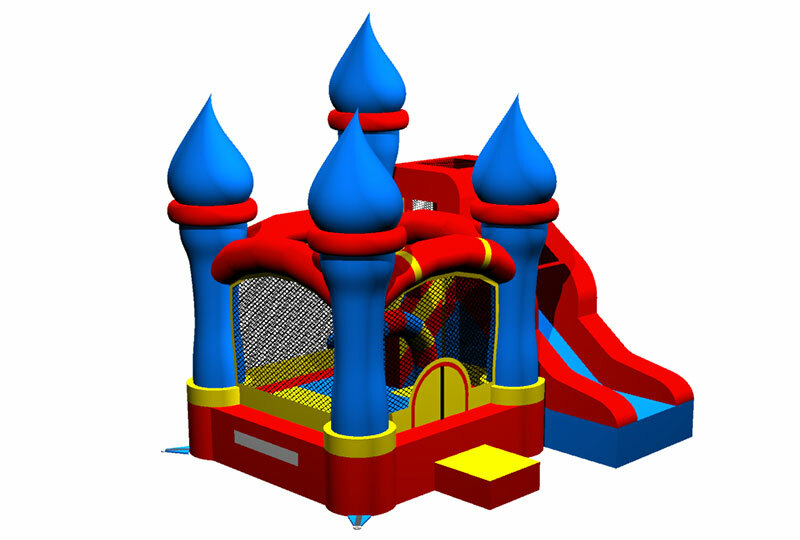 Superb Commercial quality featuring bright colours, Basketball net and a fun slide add to the FUN with this great unit! 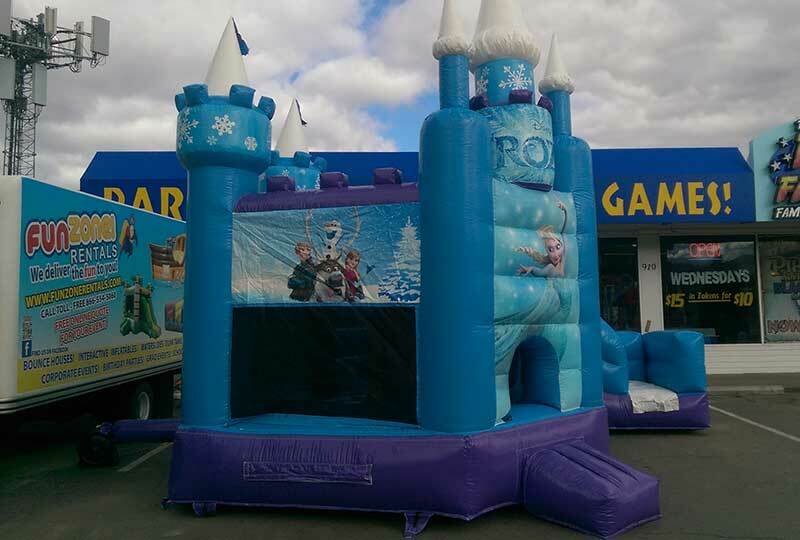 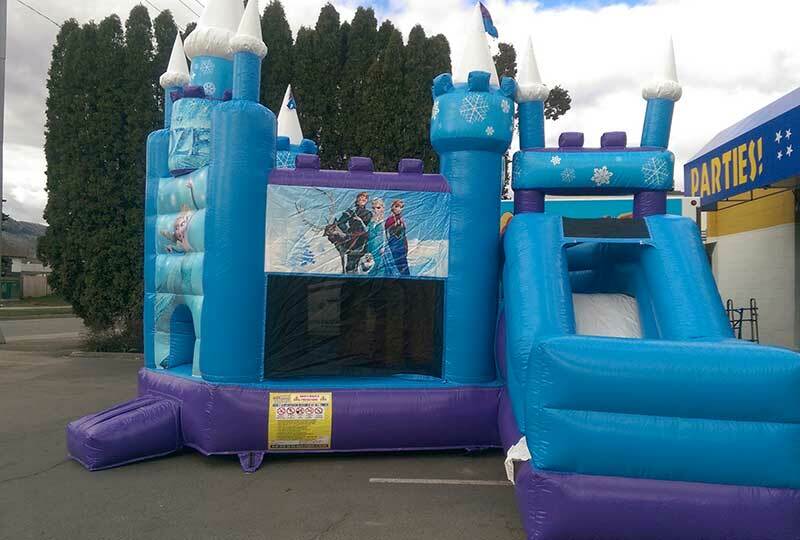 Bounce around in our Ice Palace Combo Unit! 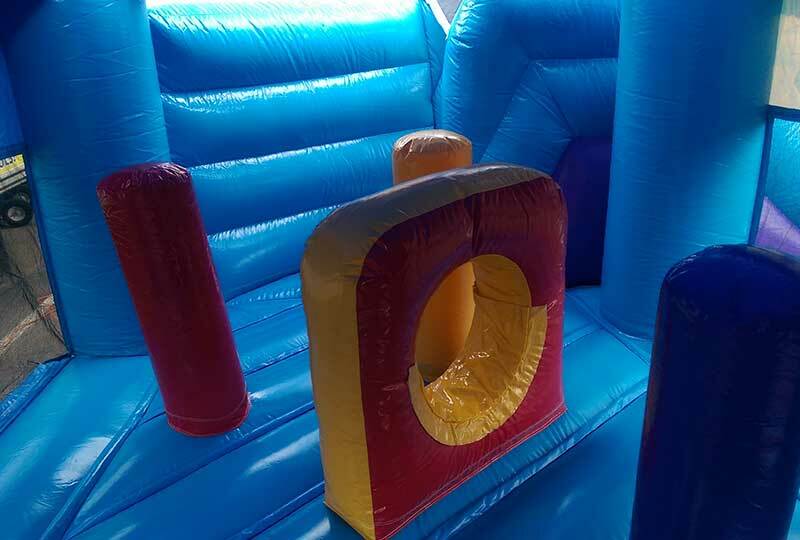 Features pop ups and a small tunnel inside the unit that kids can interact with! 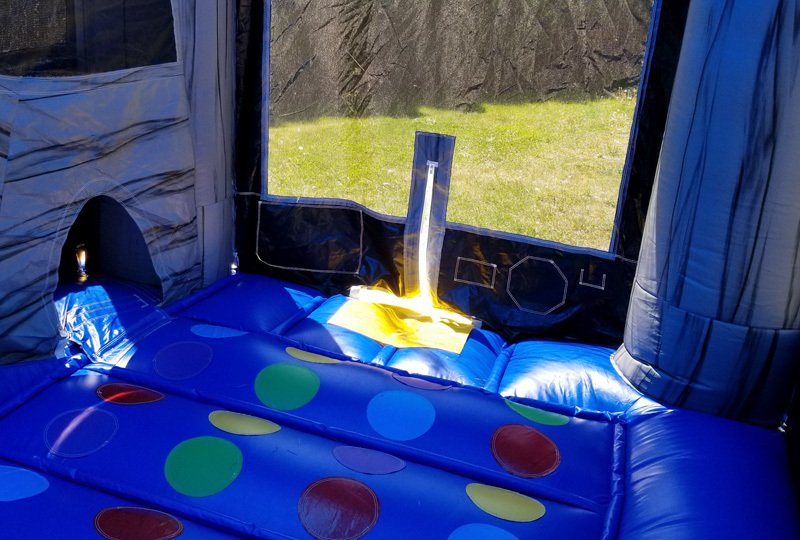 Please note the sunshade roof height is 5' - so kids taller than that might be touching the sunshade when they bounce. 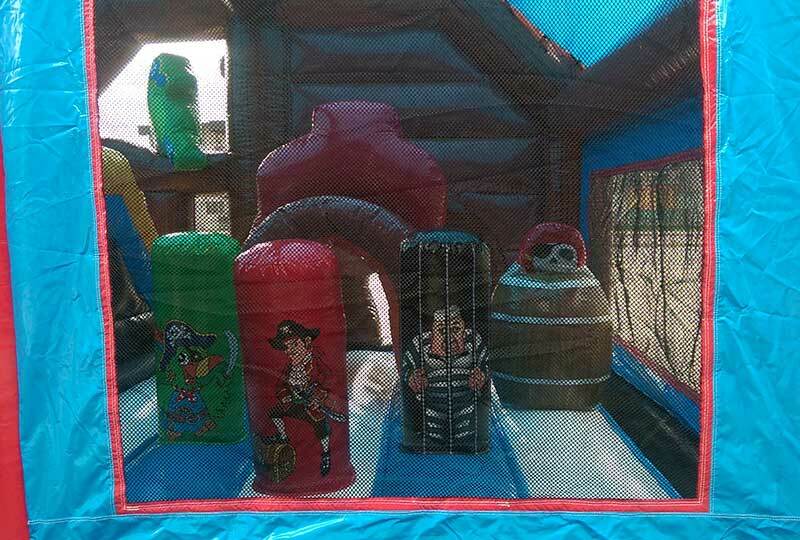 Everyone loves the carnival & a carousel! 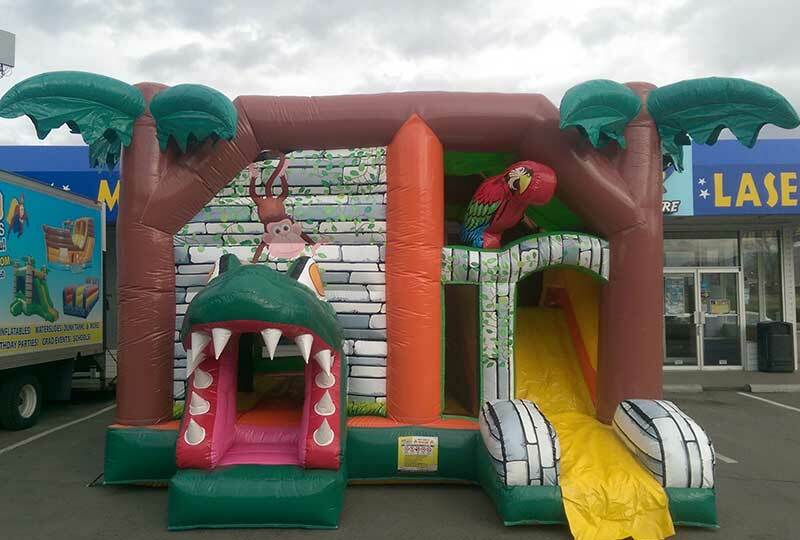 Make your next event stand out with a touch of the carnival with our Carousel Bounce & Slide! 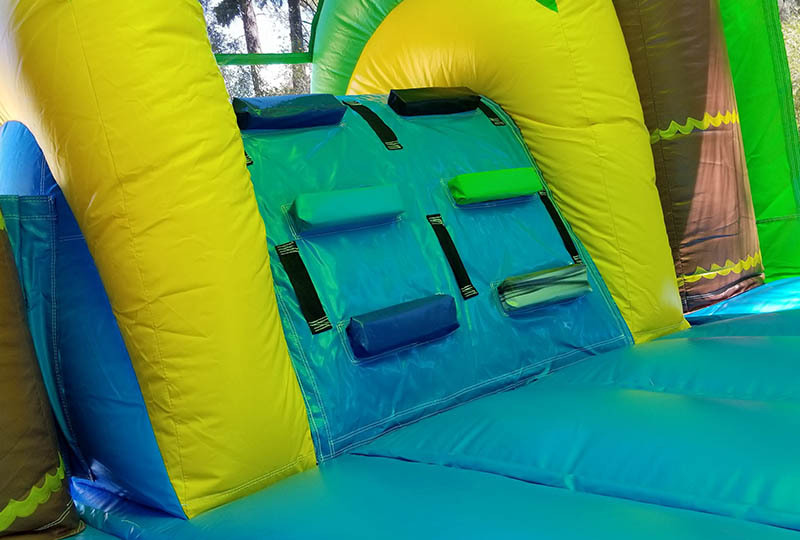 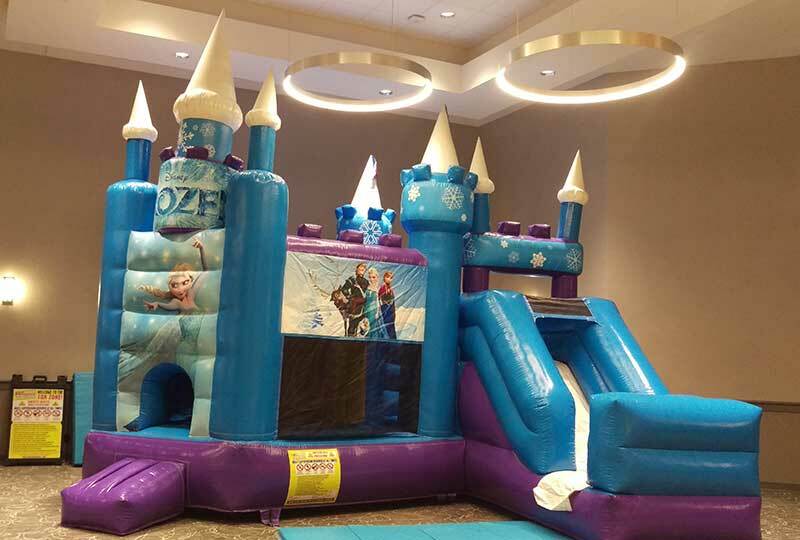 Featuring a fun bouncing area with inflatable horse, and other interactive features as well as a climbing ladder to the top of the slide, where your guests slide down to exit the fun down the slide! 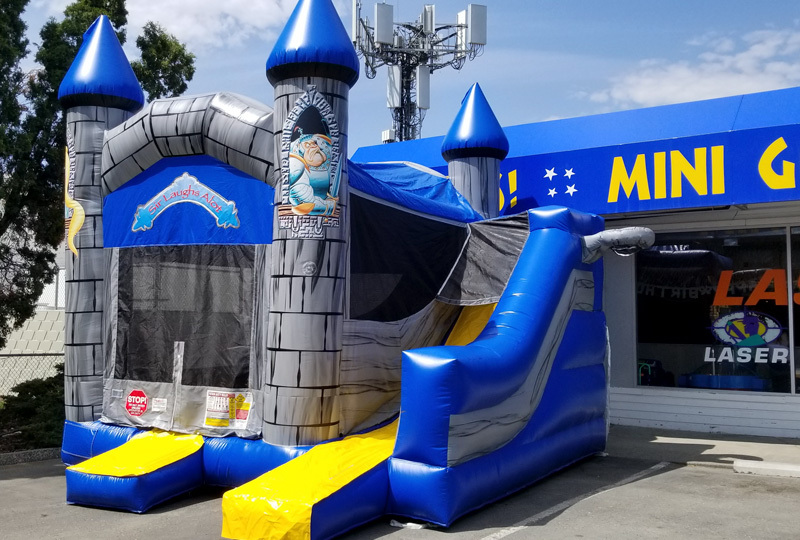 This unit has a shade roof. 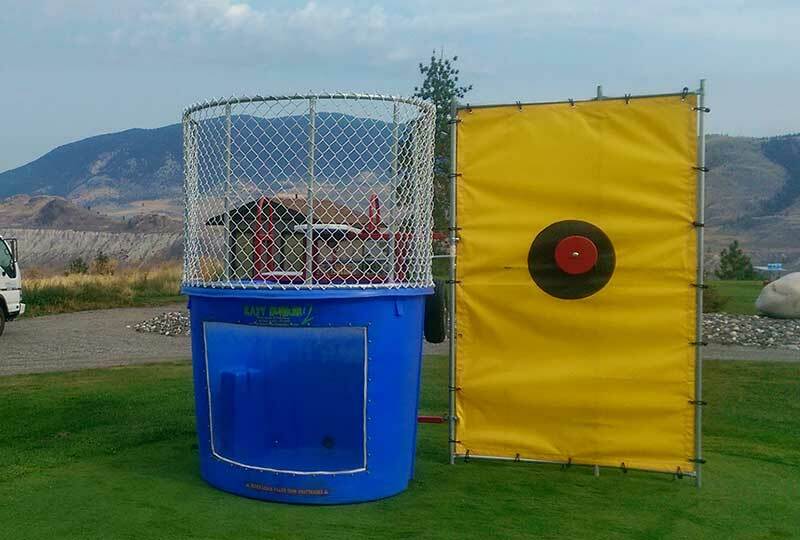 ONE OF OUR MOST POWERFUL FUNDRAISING TOOLS! 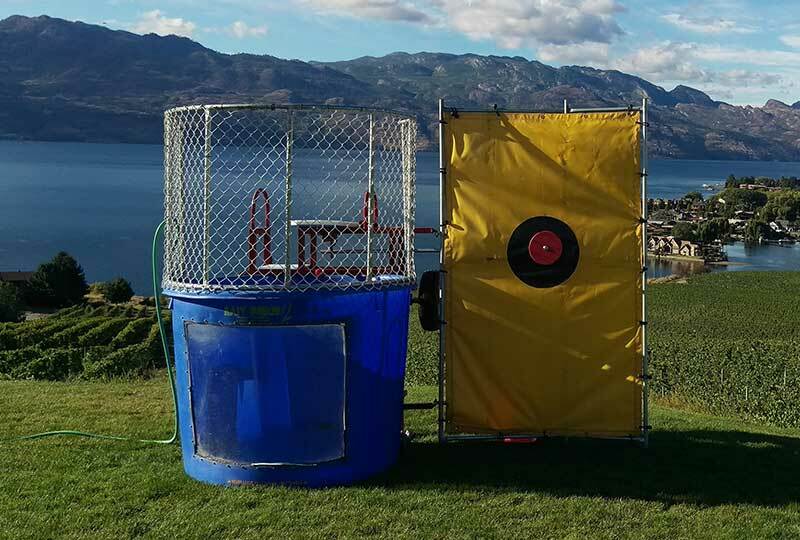 Contains a clear see-through panel so the audience can see the person in the tank! 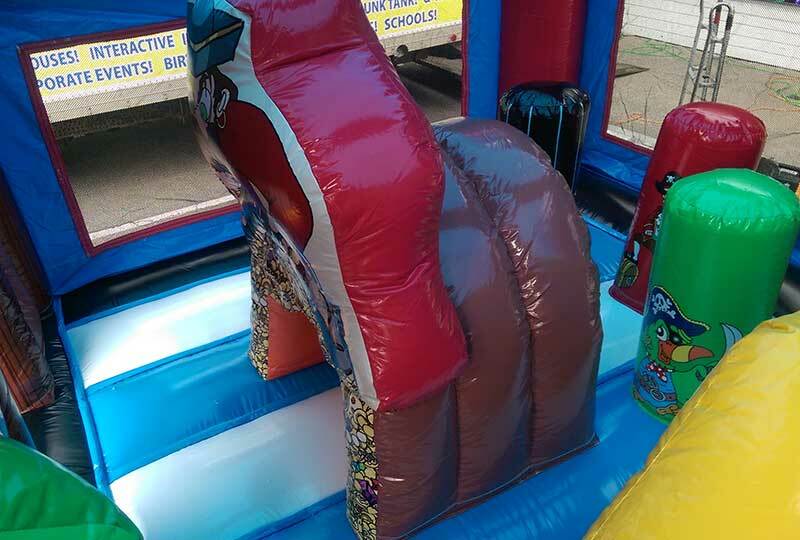 Similar to the board game "Hungry Hippo," this lifesize game is fun, interactive and hysterical! 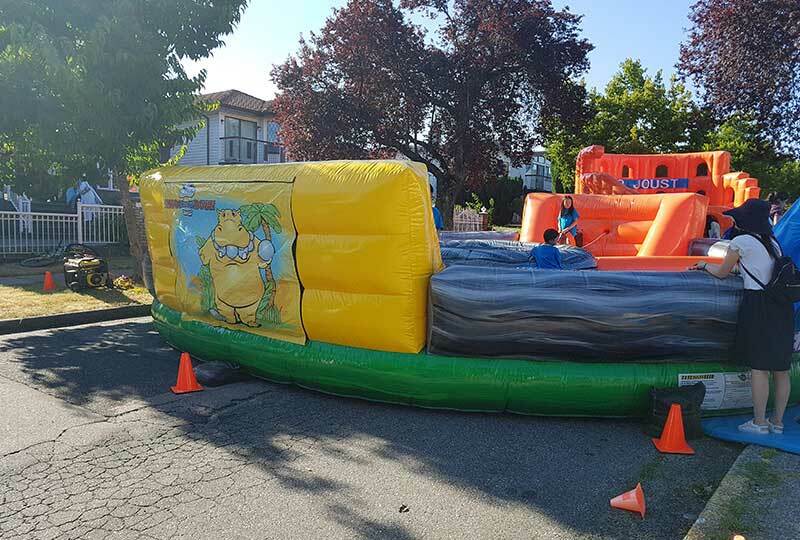 Players are tethered to a short bungee and when the game starts, they all run to the center to collect as much "hippo food" as they can, bring it back and stuff it in their "food bag." 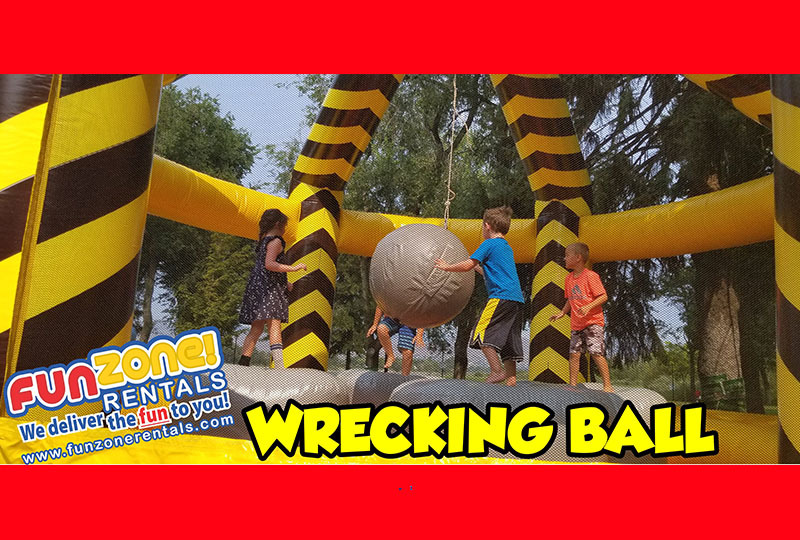 Wrecking Ball is an exciting concept for kids and teenagers! 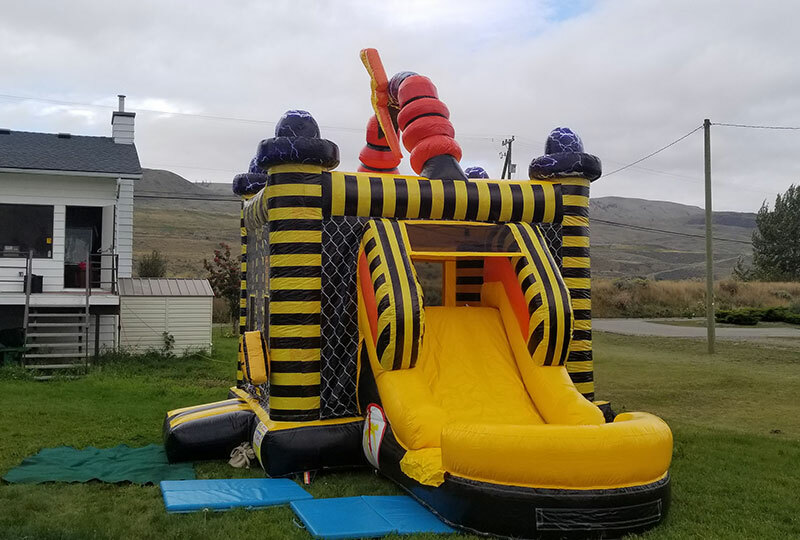 It’s big, it’s bold, and it’s extreme! 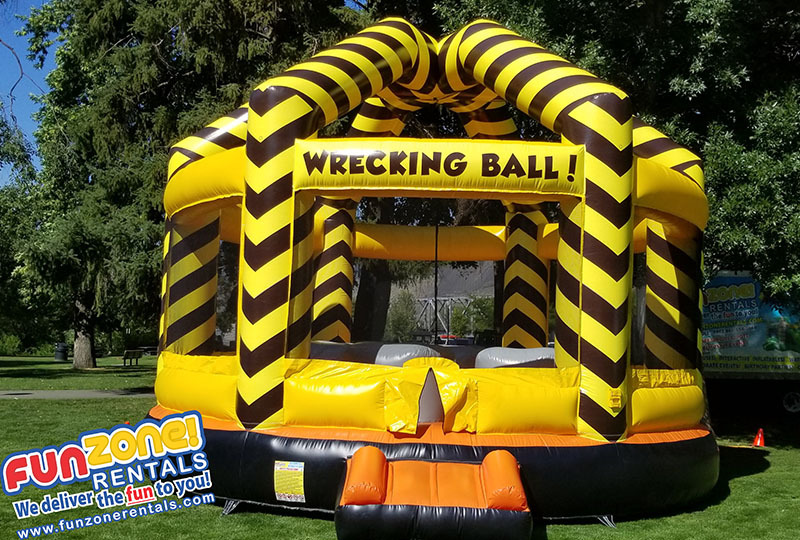 4 players climb atop their inflated pedestals, try to grab the Wrecking Ball and swing it at their opponents to knock them off their inflated pad. 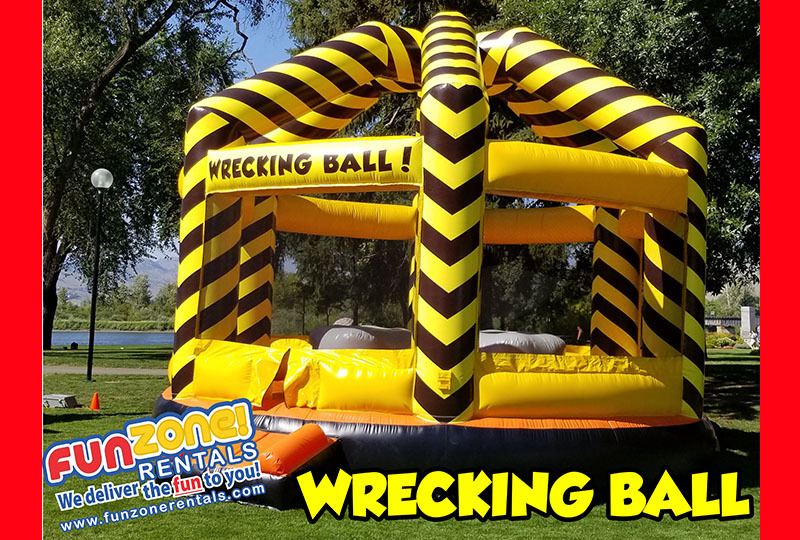 As the Wrecking Ball swings back, players try to catch it in order to swing it at the next player! 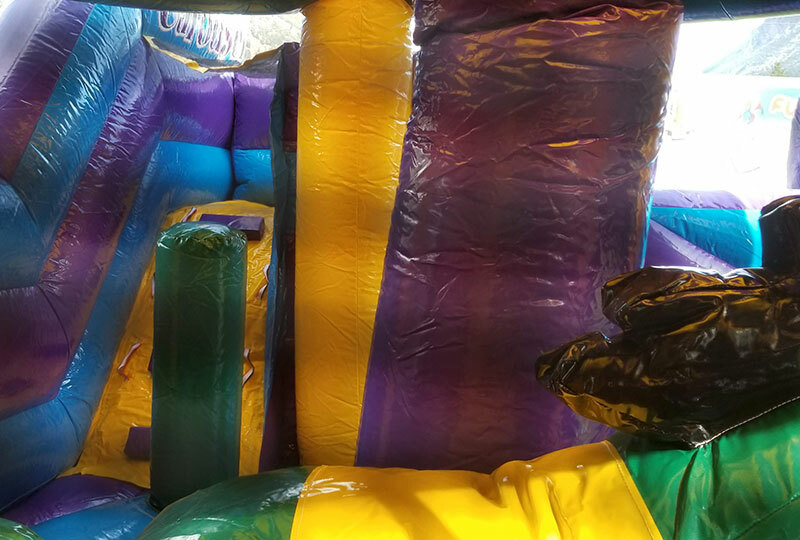 The last player standing is the champion! 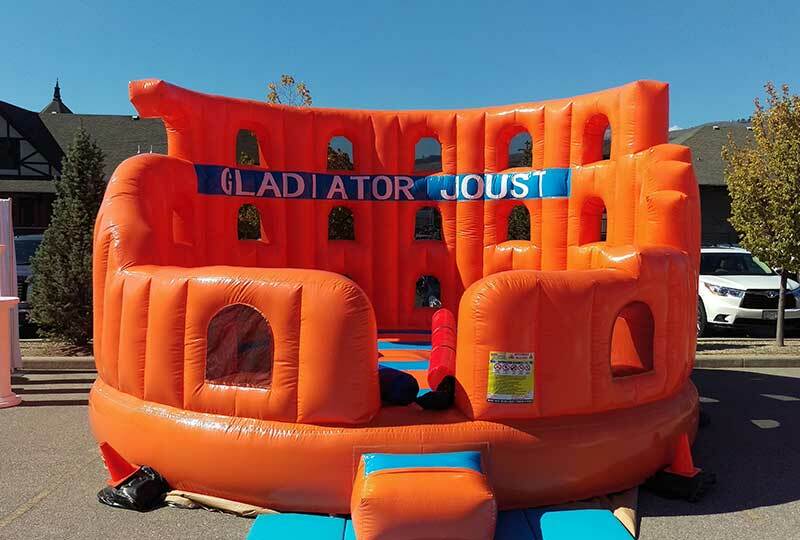 Battle your opponent in our brand new gladiator coliseum! 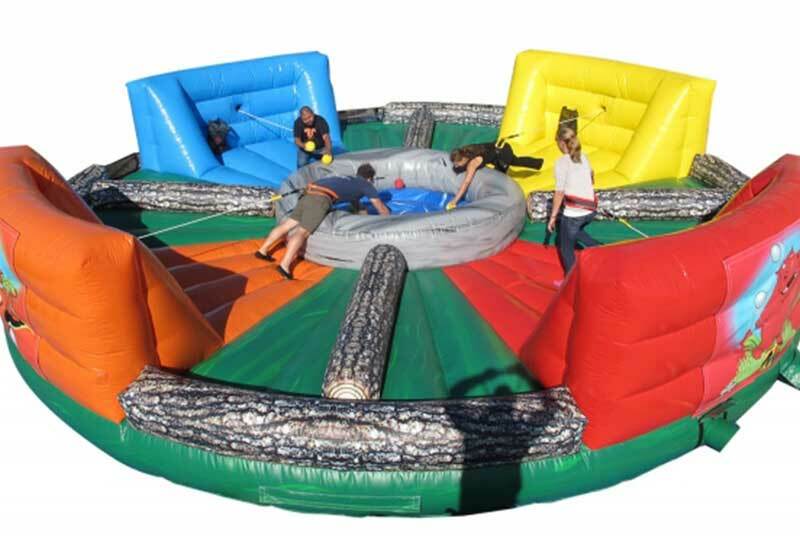 Contenstants stand on foam pedestals and try to knock the opponent off the pedestal onto the inflatable ring! 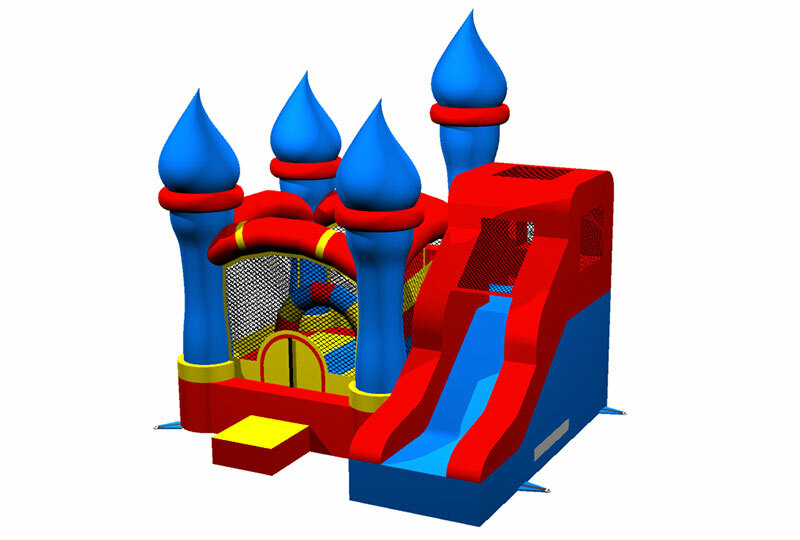 Unit is shaped in the form of the ancient coliseum! 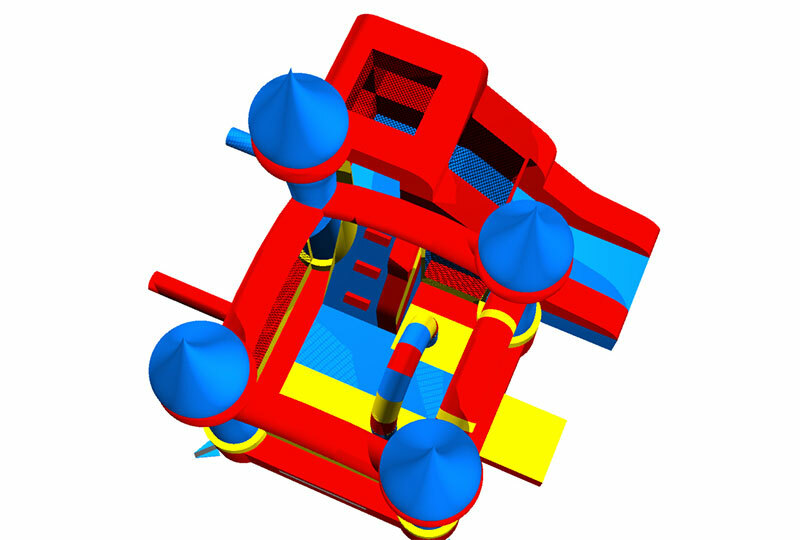 Two Players wear harnesses connected to a bungee cord! 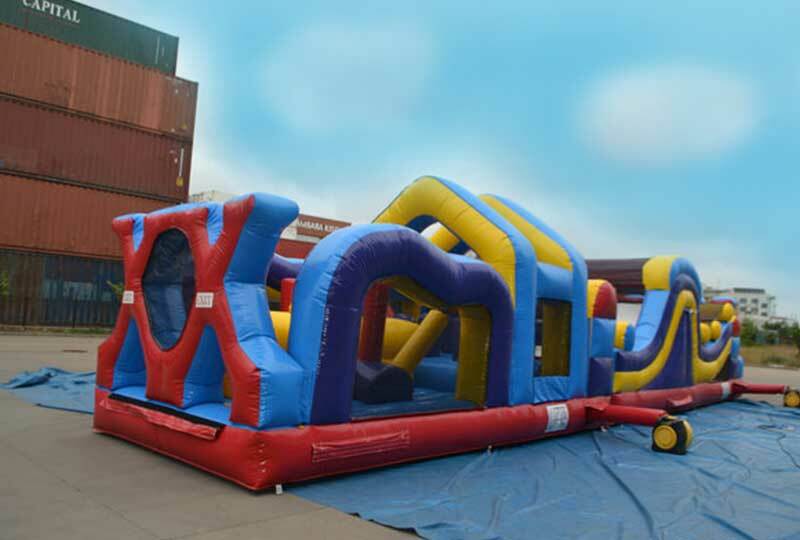 Both players race down the inflatable track, place their baton on the centre divider as far as they can! 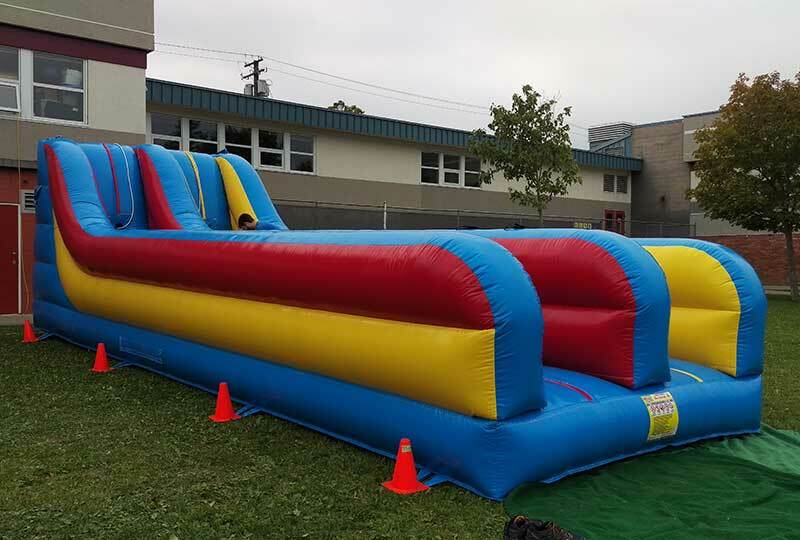 The Farthest placed baton is the winner of that race... but that's not all... the farther you go, the more energy your bungee cord has to pull the participants back to where they started! 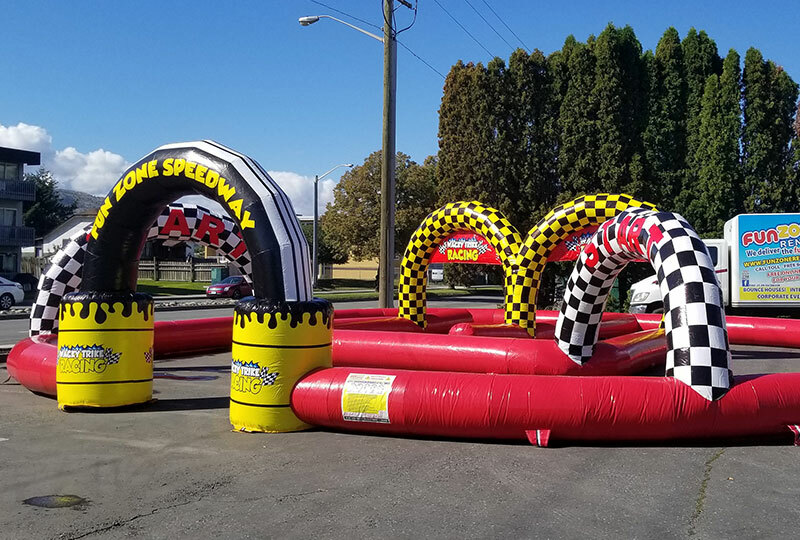 Generally, we operate this event the best out of 3 Races! 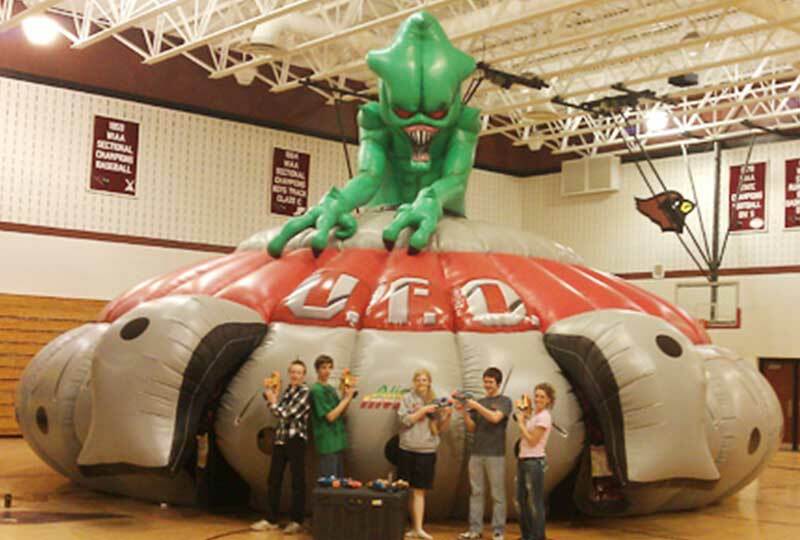 We bring the laser tag arena to you! 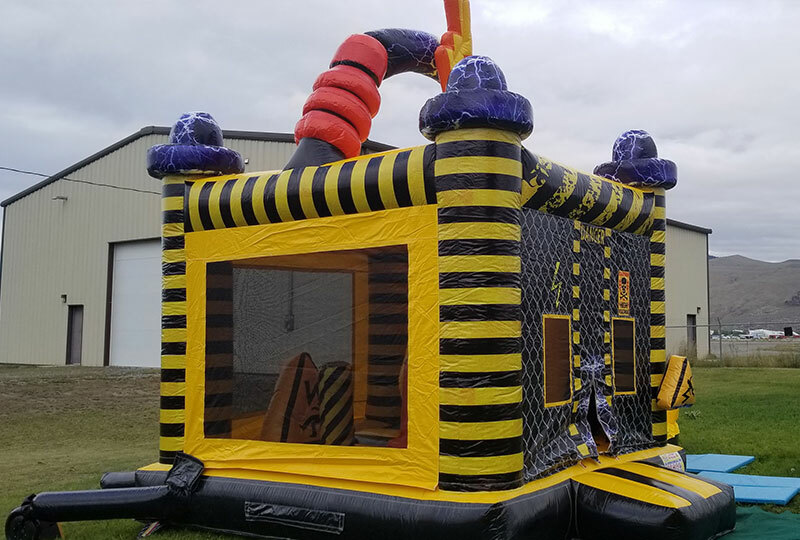 This action-packed UFO contains a maze of walls to help conceal you from your opponents as you blast them with a laser gun. 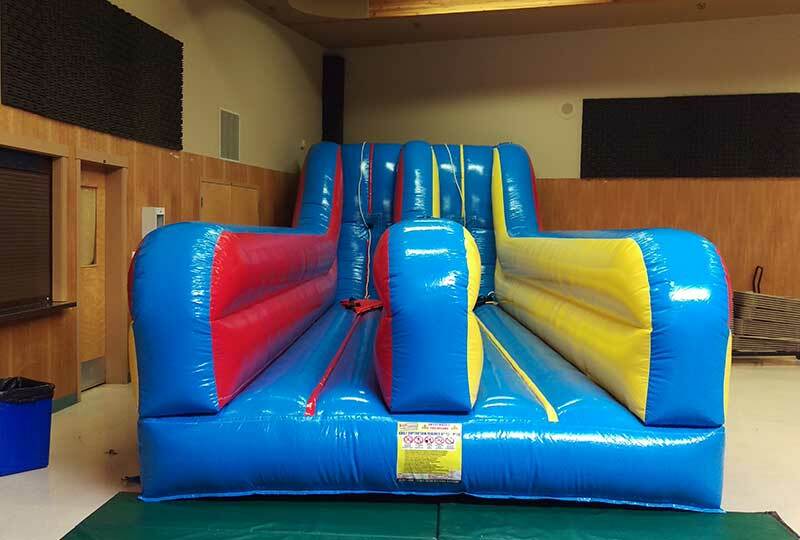 For safety reasons, the floors are not inflated and the hanging walls are not attached to the floor. 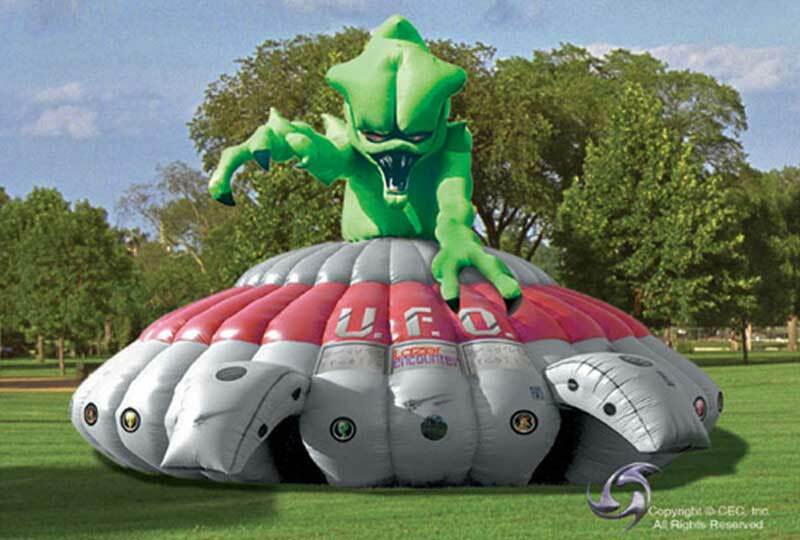 The 30' UFO has 2 entrance/exit doorways. 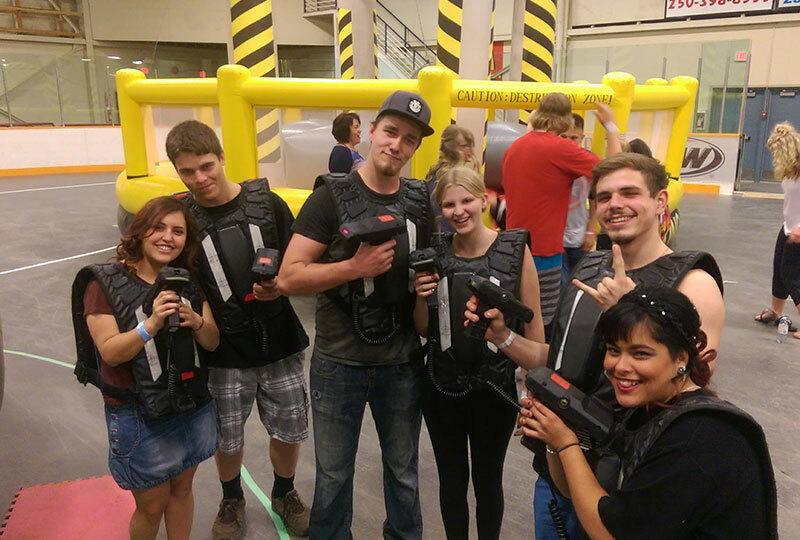 Includes Laser Tag Phasers that feature scoring on the back of each phaser. 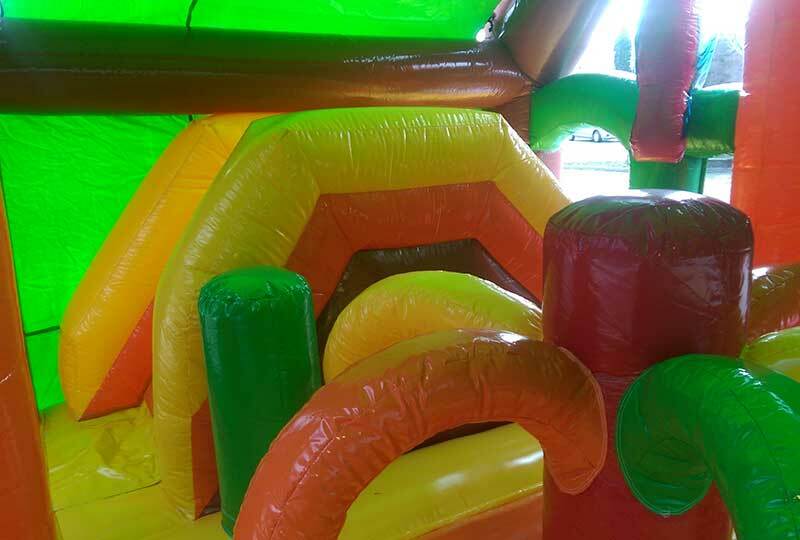 We have special effect lighting and adrenaline pumping music inside the maze! 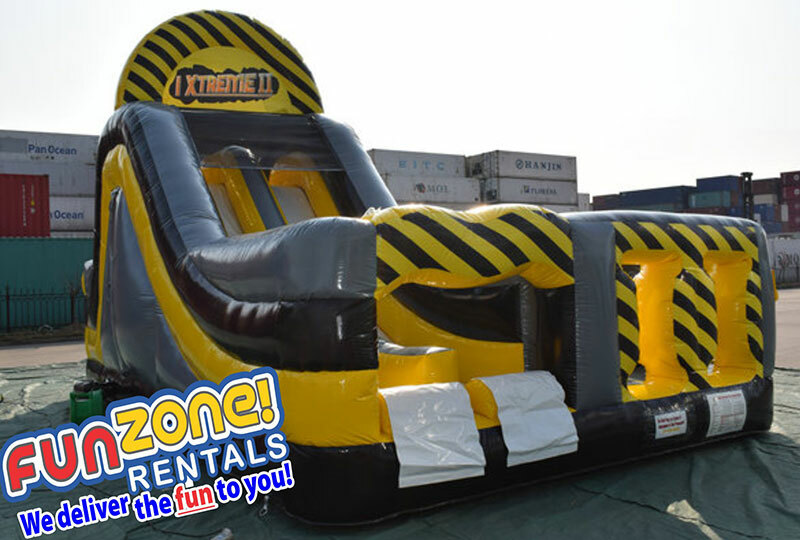 Fun Zone provides operators for this unit. 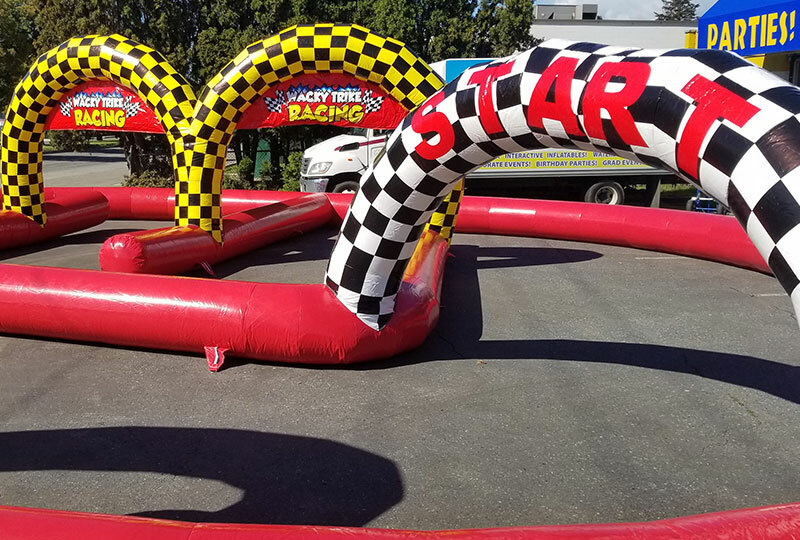 Get Ready, Get Set, GO! 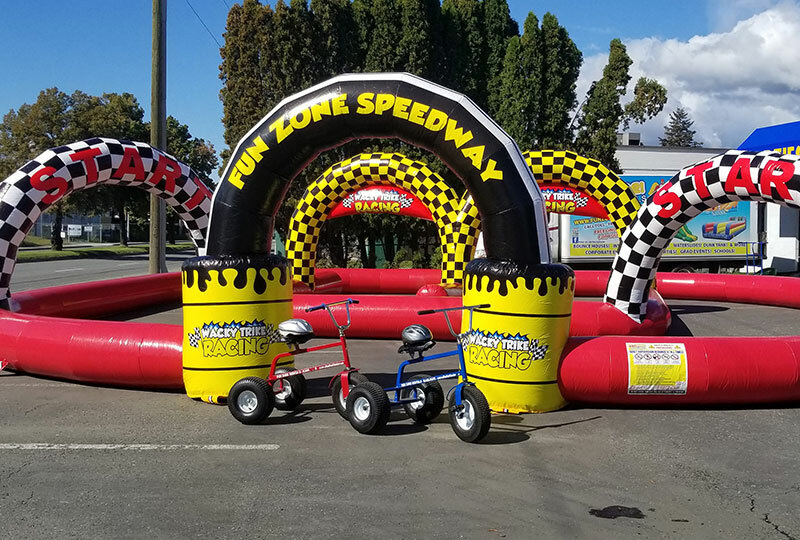 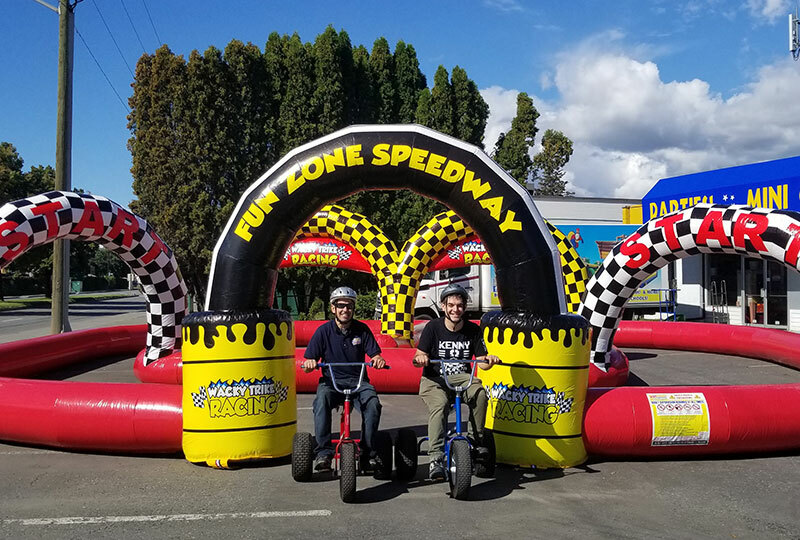 Add our incredibly bright and well themed Fun Zone Wacky Trike inflatable race track to your next event! 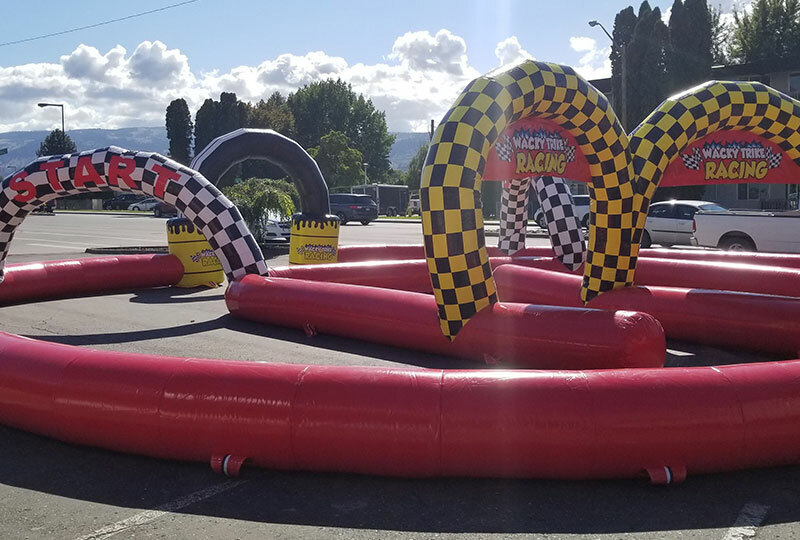 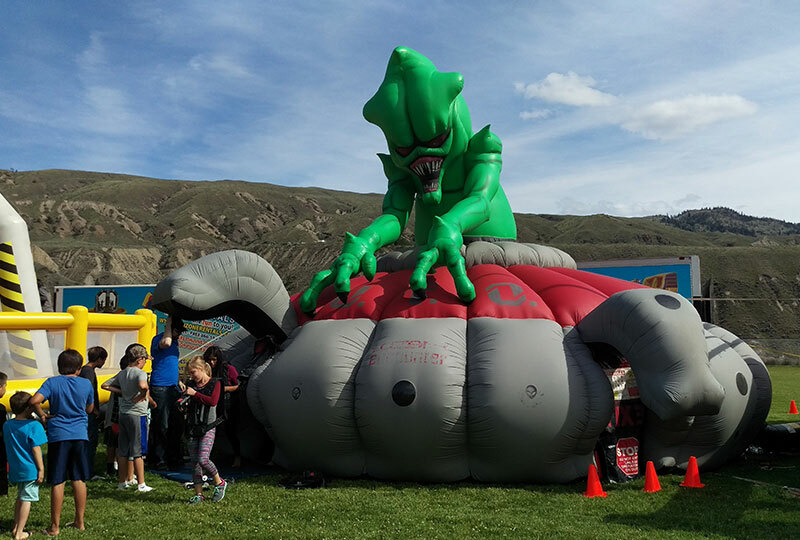 Participants can challenge each other to race through this inflatable structure designed as a race track, feed the need for speed! 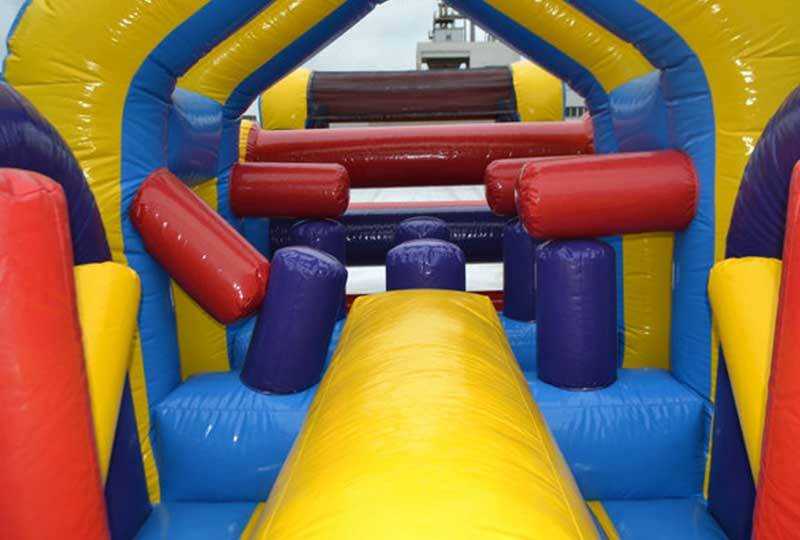 Racers will rush through inflatable arch ways and speed to the finish line! 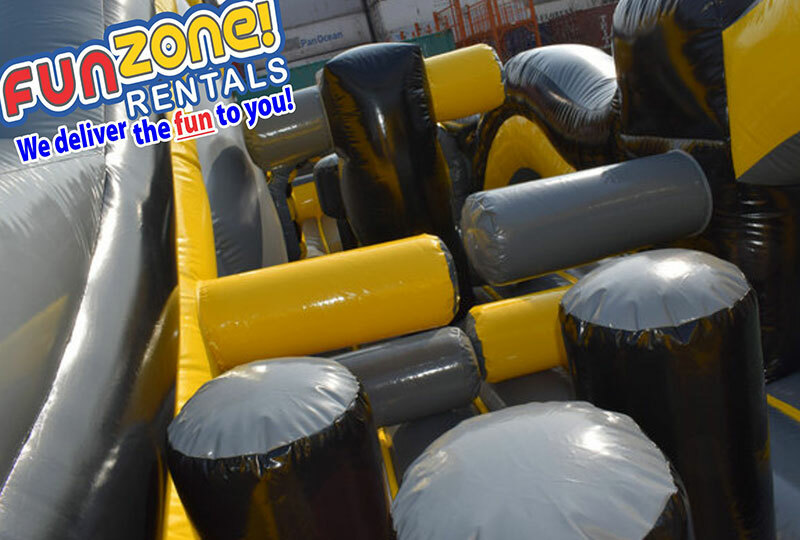 Major crowd pleaser, great entertainment, competition and fun for any event. 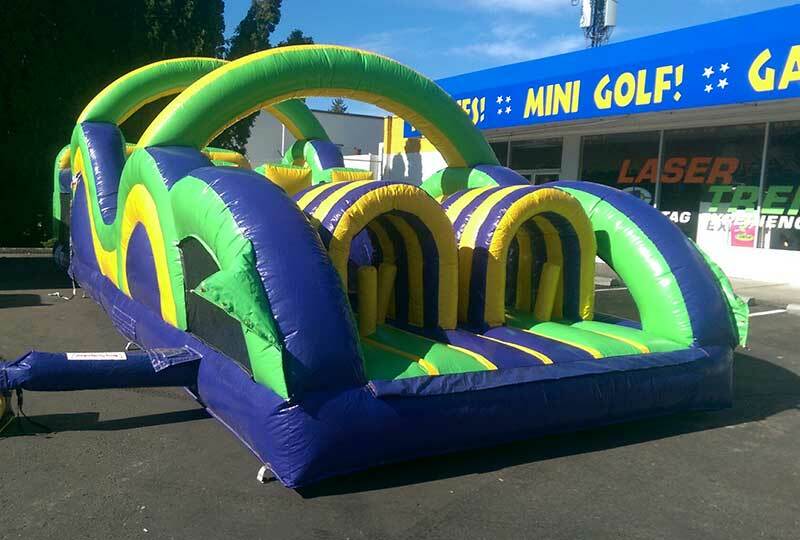 Can be setup indoors, grass or pavement. 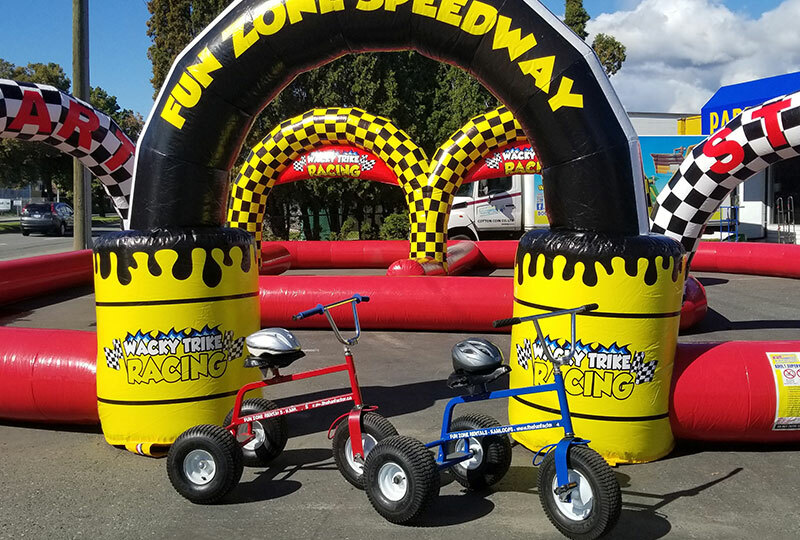 Includes 2 Commercial Grade oversized Racing Speedster Trikes designed for kids up to adults plus two safety helmets. 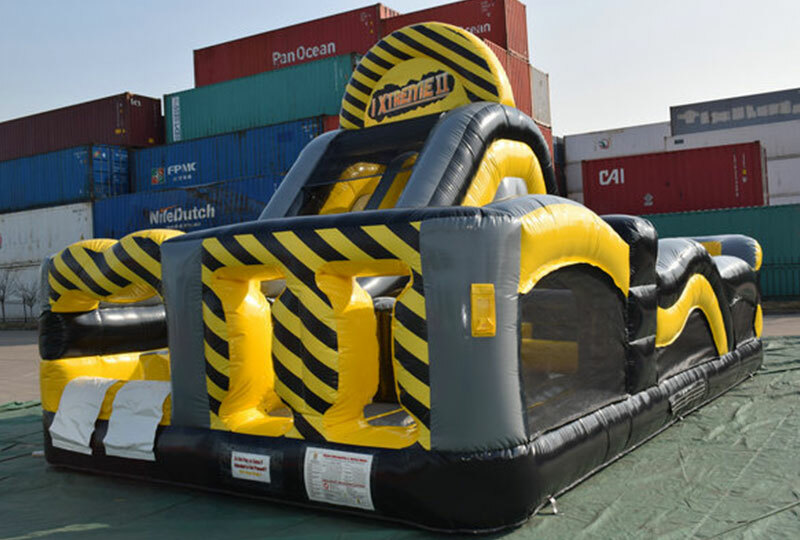 This Extreme Obstacle Course is the ultimate in compact obstacle courses. 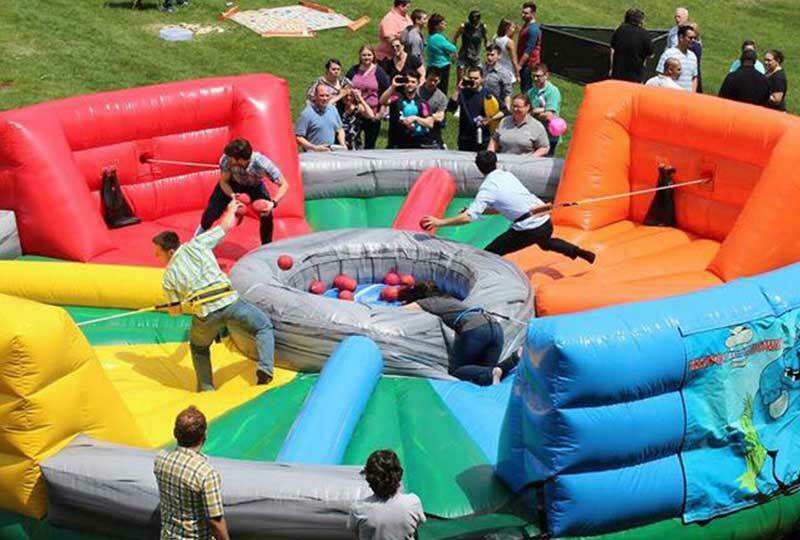 Two people can go head-to-head in a competition to tackle this physical challenge the fastest. 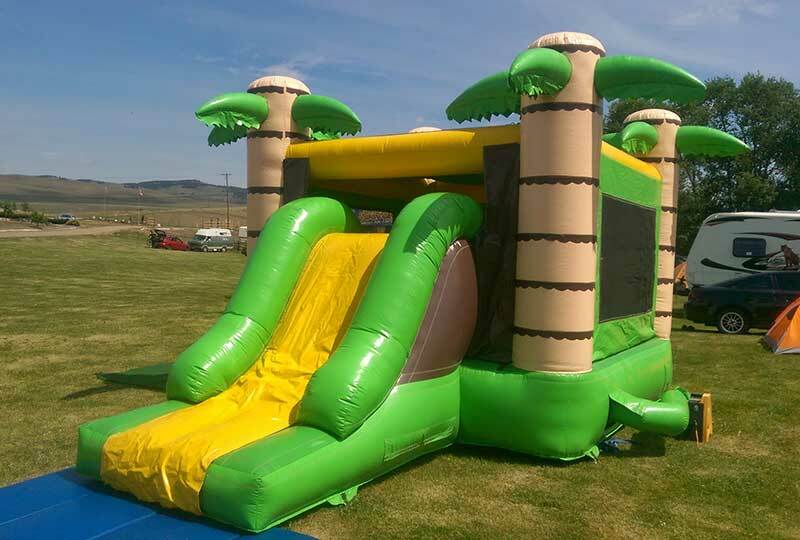 Competitors will have to fit through, crawl under, jump over, and squeeze through the multi-element obstacle course before climbing up the rock wall and going down a fast slide! 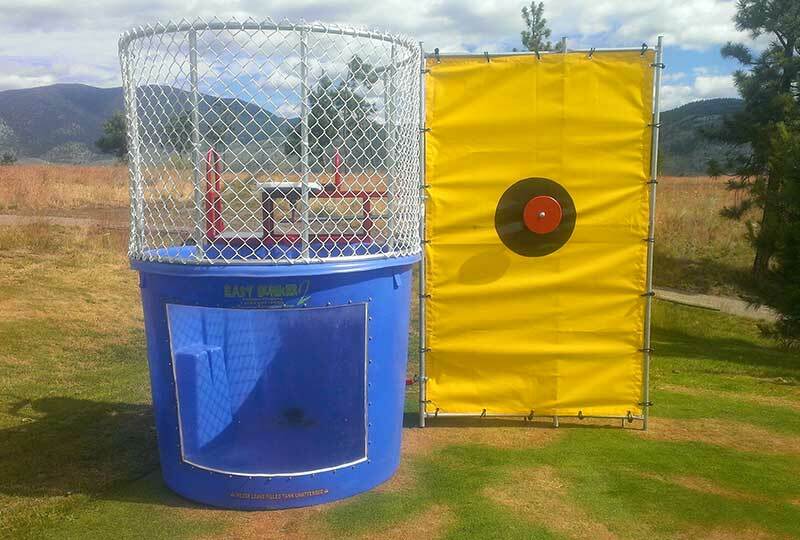 First one finished is the winner! 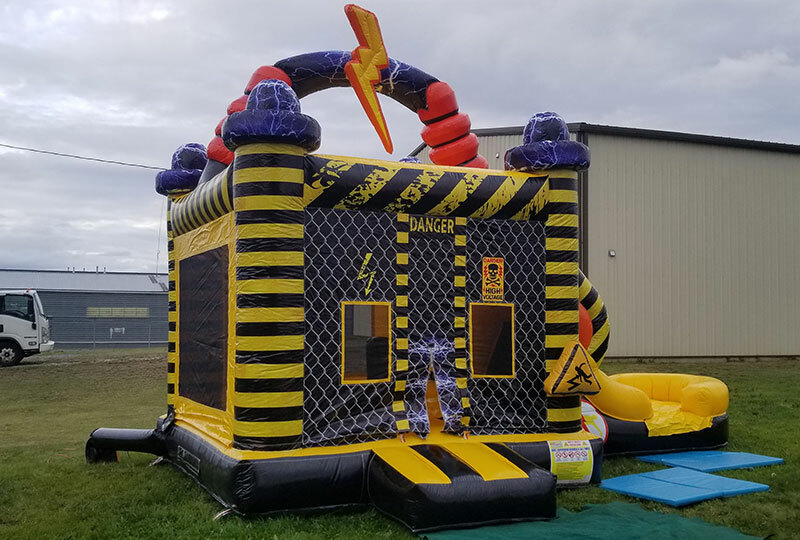 This unit features bright CAUTION colors to make your event stand out! 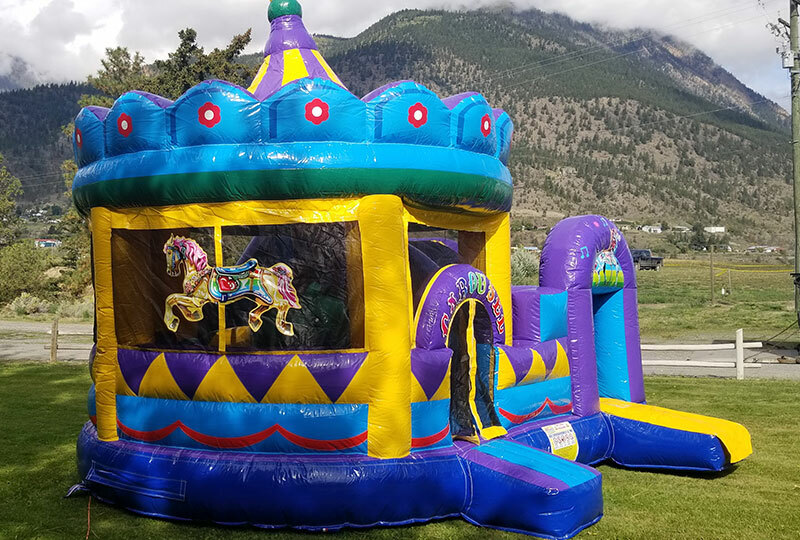 *HIGH THROUGHPUT OF UNIT! 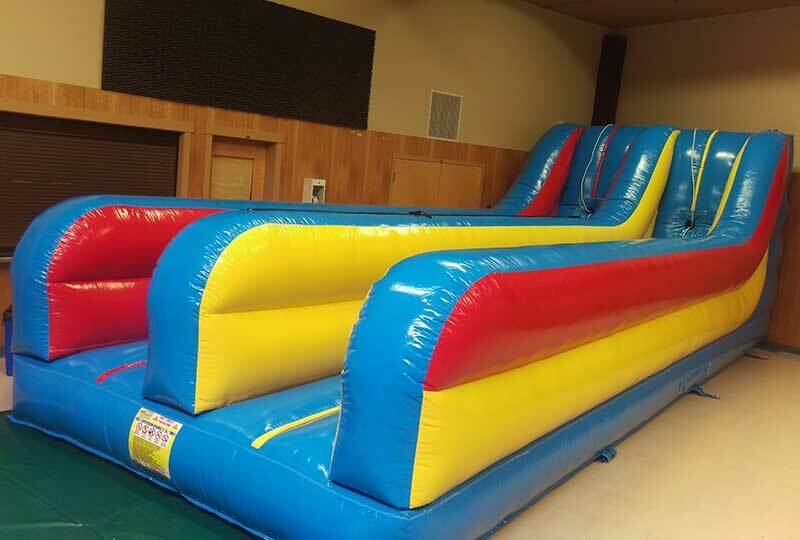 This large obstacle course features dual lanes, so two competitors can compete to get to the finish line first! 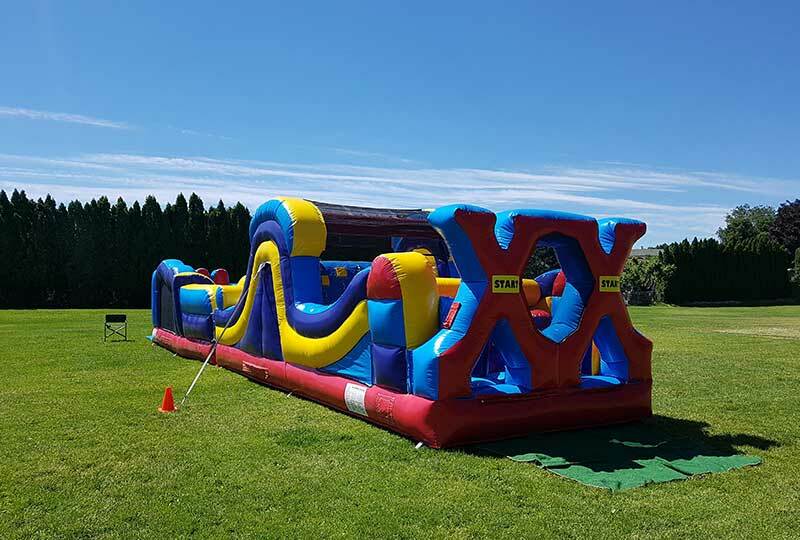 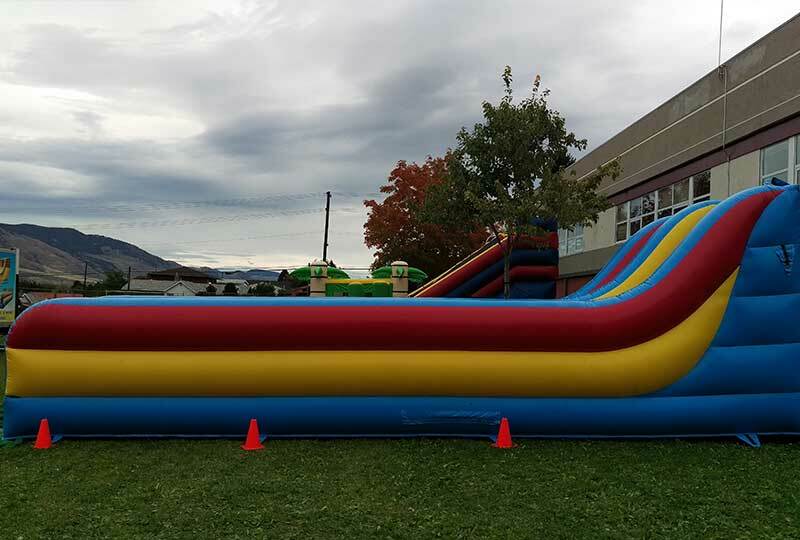 Dodge pop-ups, log jams, scramble up the climging wall, zip down the slide and sprint through the rest of the obstacles to the finish line!